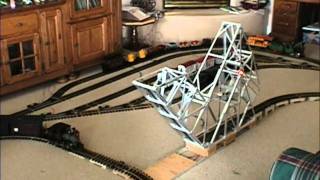 Sandy has over 230 feet of track, all controlled using his home computer. 4 different trains can run on any of 7 routes, and he can monitor where each train is at any given point. The automated drawbridge was patterned after the dual track bridge built in 1929 for the Florida East Coast Railway, in Jacksonville Harbor. All the sensors and relays are controlled by a USB-6501 data acquisition device and NI-DAQmx driver software.